"We want to understand the human and team behaviors that motivate learning to ultimately develop personalized methods of learning instead of the one-size-fits-all approach that is often taken," said Conrad Tucker, assistant professor of engineering design technology and professional programs. They seek to use machine learning to train computers to develop personalized mental or physical therapy regimens—for example, to overcome anxiety or recover from a shoulder injury—so many individuals can each use a tailor-made program. "Using people to individually evaluate others is not efficient or sustainable in time or human resources and does not scale up well to large numbers of people," said Tucker. "We need to train computers to read individual people. Gamification explores the idea that different people are motivated by different things." 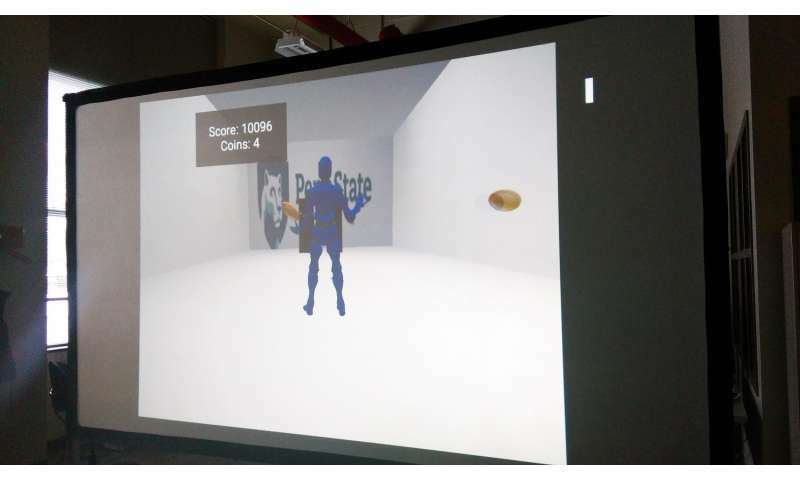 To begin creating computer models for therapy programs, the researchers tested how to most effectively make the completion of a physical task into a gamified application by incorporating game features like scoring, avatars, challenges and competition. "We're exploring here how gamification could be applied to health and wellness by focusing on physically interactive gamified applications," said Christian Lopez, graduate student in industrial and manufacturing engineering, who helped conduct the tests using a virtual-reality game environment. 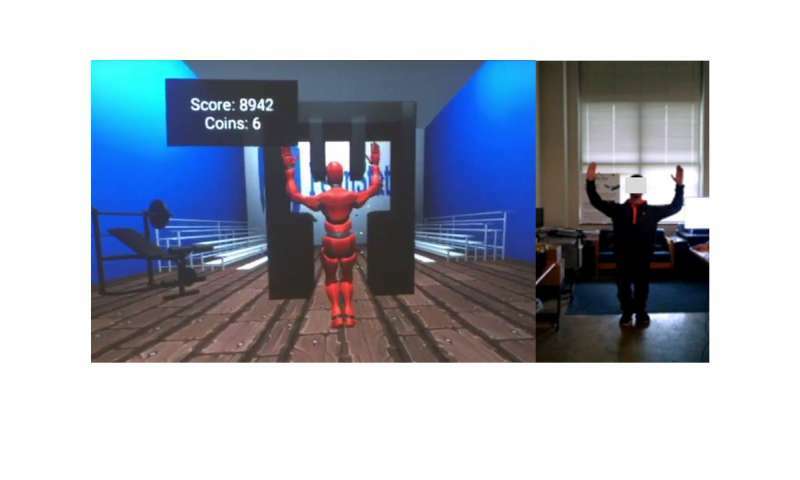 In the virtual-reality tests, researchers asked participants to physically avoid obstacles as they moved through a virtual environment. The game system recorded their actual body positions using motion sensors and then mirrored their movements with an avatar in virtual reality. Participants had to bend, crouch, raise their arms, and jump to avoid obstacles. The participant successfully avoided a virtual obstacle if no part of their avatar touched the obstacle. If they made contact, the researchers rated the severity of the mistake by how much of the avatar touched the obstacle. In one of the application designs, participants could earn more points by moving to collect virtual coins, which sometimes made them hit an obstacle. "As task complexity increases, participants need more motivation to achieve the same level of results," said Lopez. "No matter how engaging a particular feature is, it needs to move the participant towards completing the objective rather than backtracking or wasting time on a tangential task. Adding more features doesn't necessarily enhance performance." Tucker and Lopez created a predictive algorithm—a mathematical formula to forecast the outcome of an event—that rates the potential usefulness of a game feature. They then tested how well each game feature motivated participants when completing the virtual-reality tasks. They compared their test results to the algorithm's predictions as a proof of concept and found that the formula correctly anticipated which game features best motivated people in the physically interactive tasks. The researchers found that gamified applications with a scoring system, the ability to select an avatar, and in-game rewards led to significantly fewer mistakes and higher performance than those with a win-or-lose system, randomized gaming backgrounds and performance-based awards. Sixty-eight participants tested two designs that differed only by the features used to complete the same set of tasks. Tucker and Lopez published their results in Computers in Human Behavior. The researchers chose the tested game features from the top-ranked games in the Google Play app store, taking advantage of the features that make the games binge-worthy and re-playable, and then narrowed the selection based on available technology. Their algorithm next ranked game features by how easily designers could implement them, the physical complexity of using the feature, and the impact of the feature on participant motivation and ability to complete the task. If a game feature is too technologically difficult to incorporate into the game, too physically complex, does not offer enough incentive for added effort or works against the end goal of the game, then the feature has low potential usefulness. The researchers would also like to use these results to boost workplace performance and personalize virtual-reality classrooms for online education. "Game culture has already explored and mastered the psychological aspects of games that make them engaging and motivating," said Tucker. "We want to leverage that knowledge towards the goal of individualized optimization of workplace performance." To do this, Tucker and Lopez next want to connect performance with mental state during these gamified physical tasks. Heart rate, electroencephalogram signals and facial expressions will be used as proxies for mood and mental state while completing tasks to connect mood with game features that affect motivation.